Hi Fi Racks Podium (equipment rack) review | What Hi-Fi? Sleepy Oakham in Rutland is the original home of Ruddles beer (now brewed elsewhere, sadly) and it's certainly pretty enough when driving through it, but the town isn't really known for its contribution to the world of hi-fi. After looking at Hi Fi Racks' Podium rack, we think that might change. 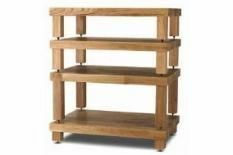 The attractive Podium is sturdily made from solid oak, with each shelf being a mighty 4cm thick. Our sample had a smooth lacquer finish, and was easy to build, taking no more than 20 minutes from start to full assembly and needing no tools. The design of this rack is rather unusual in its use of isolation spikes between solid wooden layers, but once assembled it sits firm, and Hi Fi Racks says it can easily support up to 90kg of kit. Once placed on the Podium, Cyrus's Award-winning CD 8 SE CD player is fed the Ramsey Lewis Trio's energetic Wade In The Water. It serves up a muscular sound that times well, and is able to handle production dynamics and subtleties with ease. This is a fast-paced rack that will give your kit a full sound along with a wide soundstage. Detailing here is also more than capable, and right on the nose for the money. Tonally, the Podium doesn't disappoint the listener either, with a propulsive, firm bass, smooth and fluid midrange and well-integrated treble. You'll hear, too, that the sound isn't as hard as that you can find with some metal and glass racks, with a softer edge that helps to make listening easy. There's little, if anything, not to like here. For your money, you get an enjoyable sound that isn't going to wear on you any time soon, coupled with a product where quality control has obviously taken centre stage. It's time to put the town of Oakham back on the map.